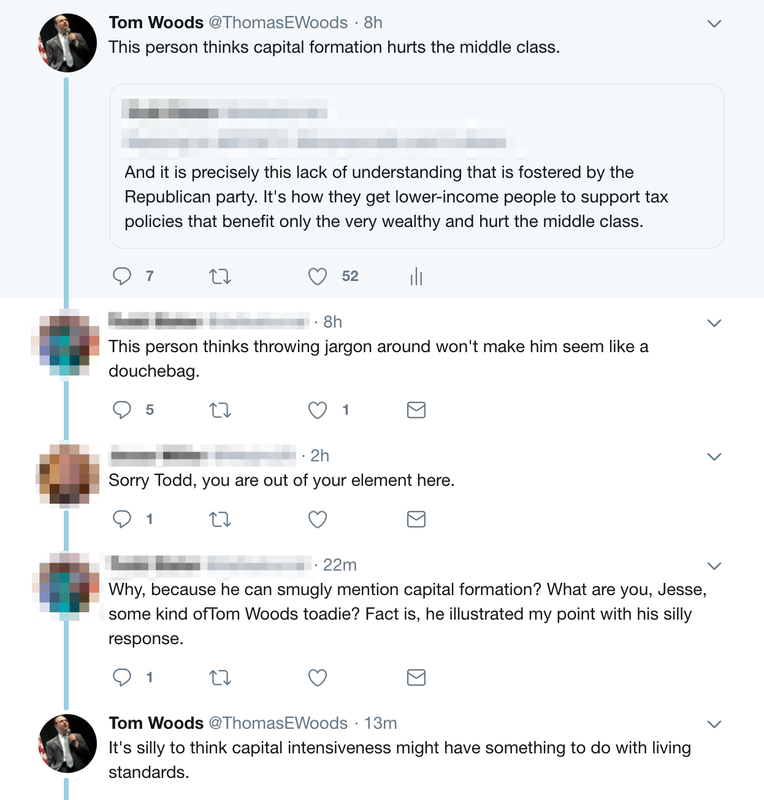 The latest issue of the Tom Woods Letter, which all the influential people read. Subscribe for free and receive my eBook Our Enemy, the Fed as a gift. Twitter is the gift that keeps on giving. So I thought I’d try to figure out what the average person who favors a policy like this knows about the economy or about what the likely consequences would be. The guy never answered my question. Now: what was I getting at? Here’s my unfashionable opinion: I believe in tax cuts for the rich. (I believe in tax cuts for everyone.) I believe the rich are human beings with rights, and not cash cows to be milked by people who had nothing to do with the creation of their wealth. Those people are anti-intellectual and can’t be reached. What I’m telling you here is for the sake of your own understanding, not theirs. Here is how wealth is created, and why confiscating the incomes of high earners is so destructive. When firms increase and improve the equipment and machinery at the disposal of workers, those workers’ labor becomes more productive. Imagine someone using a forklift (as my father did), as opposed to stacking pallets with his bare hands, or producing books with modern equipment as opposed to a 16th-century printing press. The amount of production the economy is capable of is thereby increased, often dramatically, and this increase in production puts corresponding downward pressure on consumer prices (relative to wage rates). There is nothing natural or inevitable about the availability of this productivity-enhancing capital equipment. It does not fall out of the sky. It comes from the wicked capitalists’ saving, and the allocation of the unconsumed resources in capital investment. This process is the only way the general standard of living can rise. Only in this way can the average laborer produce the tiniest fraction of what today he is accustomed to producing. It follows that only under these conditions can he expect to be able to consume the tiniest fraction of what today he is accustomed to consuming. The increases in the productivity of labor that additional capital brings about push prices down relative to wage rates. By increasing the overall amount of output, such increases raise the ratio of consumers’ goods to the supply of labor. Put more simply, improvements in the production process that lead to an increased supply of consumer goods make those consumer goods cheaper and easier for people to acquire. That’s why, in order to earn the money necessary to acquire a wide range of necessities, far fewer labor hours are necessary today than in the past. Thanks to capital investment, which is what businesses engage in when their profits aren’t seized from them and when savings are available to them to invest, our economy is far more physically productive than it used to be, and therefore consumer goods exist in far greater abundance and are correspondingly less dear than before. In 1950, for example, Americans had to work six minutes to earn the money that would buy them a loaf of bread; by 1999 that was down to just three and a half minutes. To be able to buy a dozen oranges in 1950 took 21 minutes of labor. It was only nine minutes by 1999. Paying for 100 kilowatts of electricity required two hours of labor in 1950, but only 14 minutes in 1999. Someone in 1900 would have had to work nine hours, as compared with four hours in 1950, and three hours in 1999, to earn the money to buy a pair of jeans. For a three-pound chicken, it was 160 minutes in 1900, 71 in 1950, and 24 in 1999. When people want to raise taxes on the highest incomes, they are advocating the direct sabotage of the process by which everyone in society sees his purchasing power rise. It is these high incomes that so much saving — which funds the investment in capital goods — comes from. Diverting these funds into arbitrary, politically determined consumption projects is an act of sabotage. Meanwhile, we get told that it’s the poor who drive prosperity, because the poor consume a larger percentage of their incomes. So we’re to believe that using things up makes us rich? According to this view, the economy consists of dollar bills moving from one hand to another. No conception of a structure of production, or of the role of saving, or of capital goods. Now if consumption is the source of prosperity, as these people think it is, imagine if all we had was consumption. I buy a shirt. The shirt seller takes my money and buys groceries. The grocer takes the money and dines at a restaurant. The restaurant owner takes the money and fills his gas tank. And so on. All consumption. Notice what hasn’t occurred: capital maintenance (to keep the apparatus of production intact and functioning), capital accumulation to further increase the standard of living, or the payment of wages. These fairly critical things are done by — wait for it — “the rich,” and involve the opposite of consumption. An economy lacking those things will eventually return to a primitive state. So yes, I want tax cuts for the rich, and for everyone.